No need to run back to the ship for bananas, get your pirate crew to hand one over! 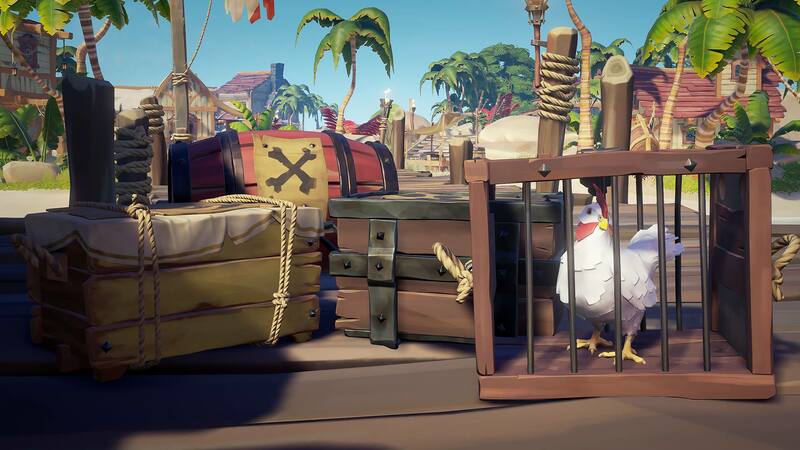 As promised, Sea of Thieves has received constant after-release support in the form of updates, and the latest one – Update 1.0.8 – includes a multitude of bug fixes, color blind support, and updates to those damnable squawking chickens. This latest patch isn’t expected to arrive until Wednesday, but Rare has let us all take a look at the patch notes a bit early. One of the most important features in video games is color blind support, and Sea of Thieves has finally received this essential tool. Players who struggle to see certain colors (especially those red Xs on treasure maps) can now opt for a high contrast X that appears as a white X with a black outline. It’s a small change, but one that should grant more accessibility to players that need it. Caged chickens have now been calmed down. No longer will a galleon full of chickens wake the dead as they’re ferried to the Merchant Alliance. This wasn’t the only audio-based update, as an on-screen icon will now display whenever your voice is being broadcast in-game. A host of audio updates has also hit the Legendary Hideout for those pirates who have reached that status already! Finally, as mentioned in the title, item sharing has been re-added after being removed shortly after update 1.0.7 went live. The issues it caused have been fixed and everything should be working as intended (hopefully). Now players can give one another bananas or cannonballs without running back to the ship or looking for barrels on an island. 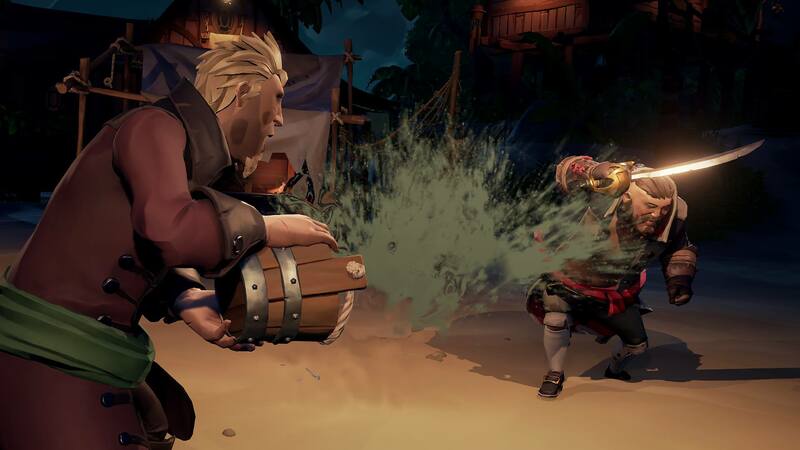 For Windows 10 players struggling to get the game to update, check out our guide on how to update Sea of Thieves on PC. On to the Next! - Players can now discard unwanted voyages within the Quick Menu. No more having to propose them on the Captain's Table and cancel them! Did You Hear That? - When you are transmitting voice over your mic, an icon will now appear on screen to let you know that you are doing so. Stories Untold - Players will now come across more Lore books on their adventures. Give and Take - Resource Crates which are being held by players can now have items put into or removed from them. Distressed Chickens - The unsettling sound of a squawking chicken whilst caged is now... more bearable. Music of Legends - The musical sting that plays when entering the Legendary Hideout has been updated. Updated Voice Lines - Legendary Tavernkeeper Louise, the Pirate Lord and the Order of Souls NPC Olivia now have new ghostly-sounding voice lines. Visual Effects - Improved multiple VFX of weapon impact to grass terrain, and cannon impact to water. Icons - Updated the Chests UI to make it clearer that players can scroll through the filter tabs. Icons are now also prettier, bigger and generally better. Out Of Stock - Shipwrights and Weaponsmiths will no longer stock the eight cosmetic pieces which weren’t visually distinct enough. Launch Crew Eye of Reach - We kept it in for an extra week due to its popularity, but this time-limited item has now been removed from the weapon shops! Colour Blind Accessibility - There is now a High Contrast 'X Marks the Spot' option in the Accessibility Settings. Enabling this will change the red X on the map to white with a black outline, which we understand will be easier to view for red-green colour blind pirates. Aim Sensitivity Slider - Player can customise their controller and mouse sensitivity specifically when aiming with each ranged weapon. The Blunderbuss, Flintlock Pistol and Eye of Reach each have their own slider to adjust. Shhh! - Additional muting options have been added to "My Crew". These now include the ability to mute voice, text chat and non-verbal phrases separately. These Sea of Thieves’ updates and improvements appear to happen every week, which is a nice rhythm to be in as problems that were once plaguing certain players are being addressed. We’re now a little under a week until The Hunger Deep surfaces in Sea of Thieves, and we here at Shacknews are preparing to tackle whatever monster pokes its ugly head above the waves!